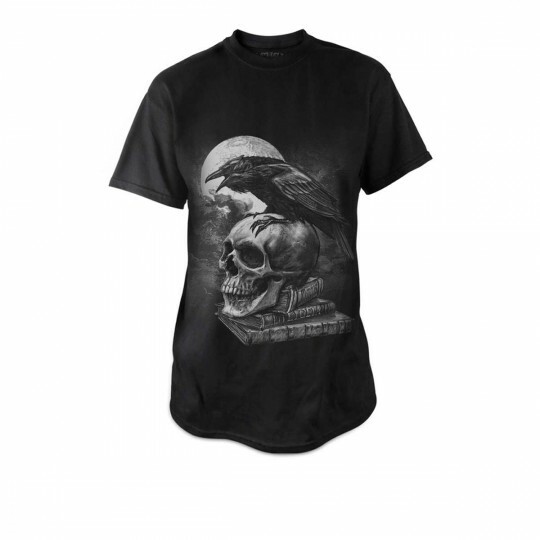 BT810 - Poes Raven T-Shirt in Tops, Blouses & Shirts is made for Women and Men and comes in Black and is made of Pewter material. It is marked as TShirts and weighs about 1.00 lb. Edgar Allan Poes seminal creation alights upon the skull of his poetic father. The master of the macabre whose short life echoes the cry of the raven Nevermore.